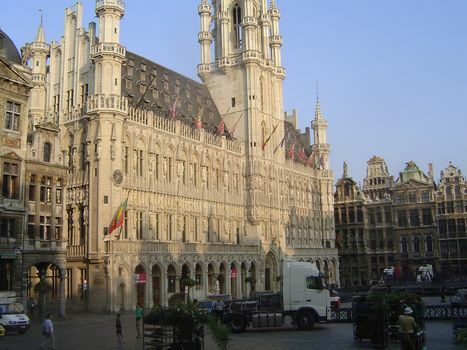 Brussels is renowned for its Grote Markt or Grand Place, on UNESCO's world heritage list since 1998 as an illustration of "the social and cultural life of... this important political and commercial centre." That's suitably vague. On the ground, the Place is a paved square rimmed with buildings whose most interesting aspect is not their architecture but the fact that each was built to its owner's taste, without any centrally imposed style. 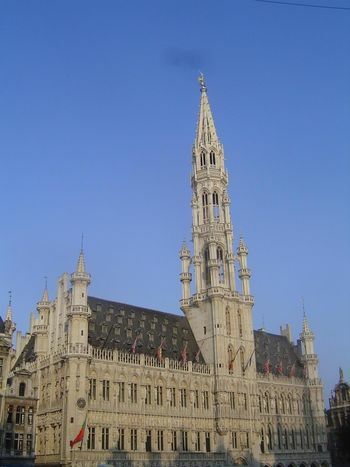 The most prominent building is the Town Hall, whose left wing is from 1402. 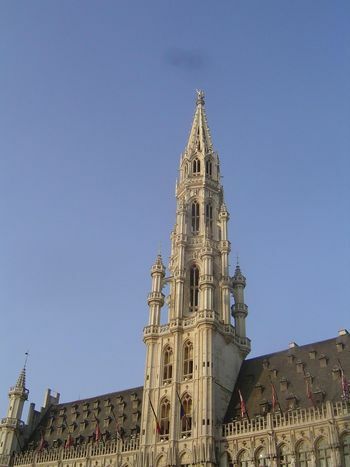 The tower, finished in 1449 and 295 feet high, was supposed to be the corner of the building, but a right wing sprouted later. For a sense of scale: the vane, in the shape of the Archangel Michael, is 16 feet high. Opposite the town hall is this building, which like so many buildings in Europe, is not nearly as old as it looks. In the 13th century there was a wooden building here used by bakers to sell bread; hence the Dutch name Broodhuis, literally "bread house." In the 14th century, wood was replaced by stone, but in the 15th century the bakers started selling door-to-door, leaving the building to be taken over for administrative use by the Duke of Brabant. 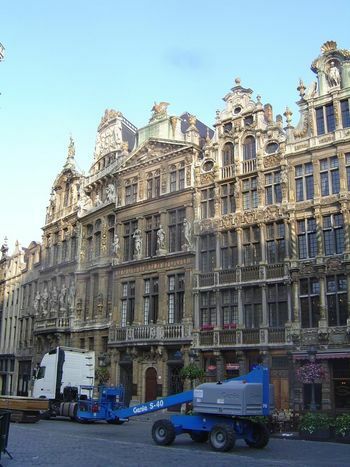 That's why the building in French is called the Maison du Roi. In any case, the building was in poor repair by mid-19th century. 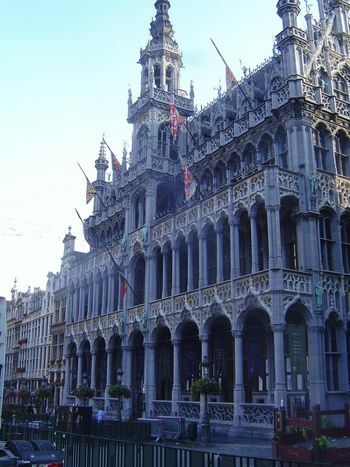 The city bought it and started again, this time copying the 16th century town hall of Oudenaarde. 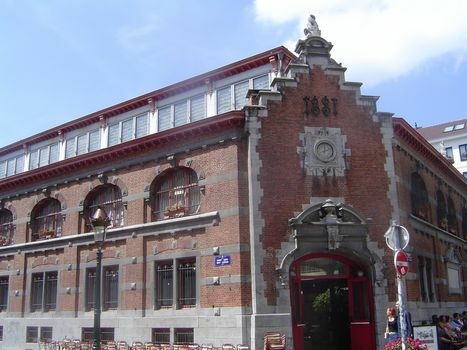 In 1887 the new building was opened as the city museum. Goes to show that Americans aren't unique in their frequent attempts to put up buildings that seem instantly historical. 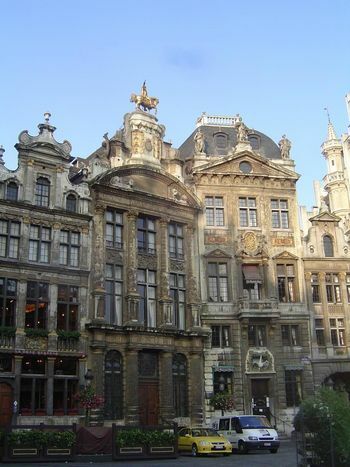 What's more interesting than these two dominating buildings is the collection of guild houses that completes the square. 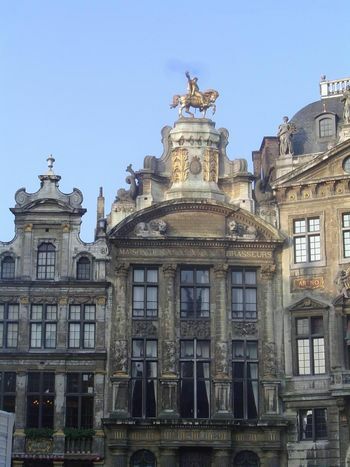 A few can be seen on either side of the town hall, whose statues--in another bout of reconstruction--were all destroyed in the French Revolution, then replaced. We're looking now at the guild houses that were on the right side of the previous picture. Almost all of them were rebuilt about 1700, after the French had destroyed them by bombardment. 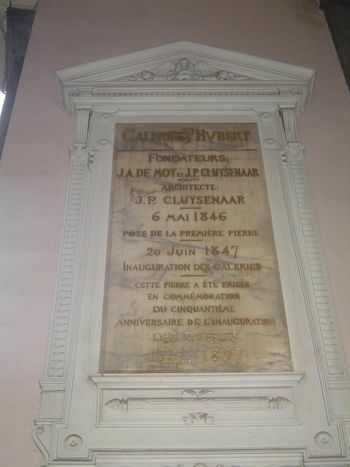 Two centuries later, about 1900, they were restored. Each was built by a guild and has a name, which usually has very little to do with the work of the guild. From the left is the Fox, which served cloth merchants; the Horn, which served sailers; the She-wolf, which served archers; the Sack, which served carpenters and coopers; the Wheelbarrow, which served grease dealers, and the King of Spain, which served the city's bakers. We've turned around 180 degrees to see Mt. Tabor and The Rose, both of which were built as private houses. 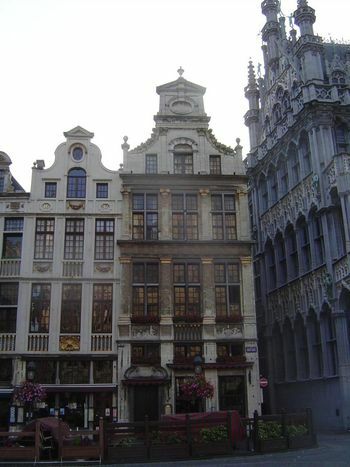 On the right is the Golden Tree, a guild hall that over the centuries served tanners, then upholsterers, and finally brewers. Here's De Roose and the Gulden Boom again, followed by De Zwaan or Swan, which was the guild hall of butchers, and the Star, which served judges. The Golden Tree, or Gulden Boom, is topped with a statue of the Governor of Holland, Charles of Lorraine, on a pedestal trimmed with hops, apropos beer. De Zwaan, for butchers, is appropriately solid and grim. Here are the guild halls flanking one side of the Maison du Roi: from left to right, they are the annex to the King's House; the Pigeon, which served painters (and where Victor Hugo stayed part of the time he was exiled from France), and the Golden Galleon, which served tailors and has a statue up top of Bishop Saint Boniface. Next to the bishop, on the right, is l'Ange, the Angel, which belonged to the Abbey of Forest. On the other side of the King's House: the Little Fox and Peacock, private houses. So: what to make of all these buildings? 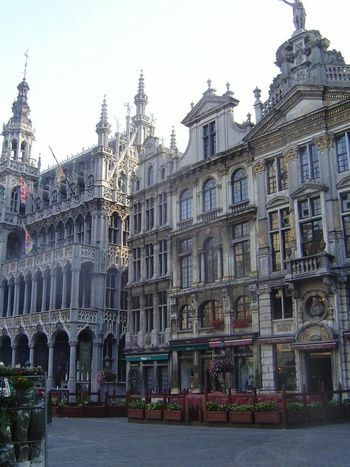 Piet Swimberghe and Jan Verlinde, writing in Brussels: The Art of Living (1998), suggest that it shows the determination of the bourgeoisie to flaunt their wealth. But they go on to a more interesting point. 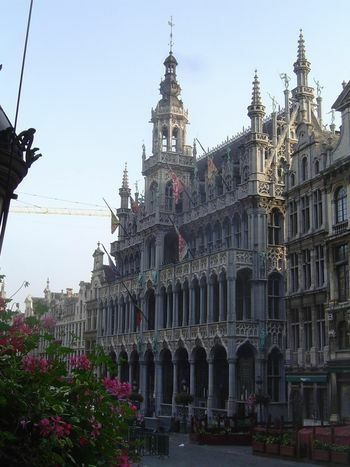 They refer to Victor Hugo and say that he "understood that the fundamental difference between the architectures of Brabant and France is not one of styles, but of unity. 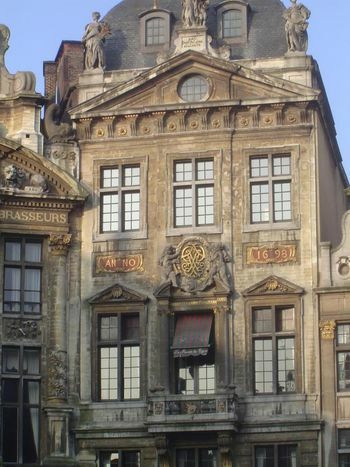 French architecture followed the dictates of the king's taste and the requirements of the military. 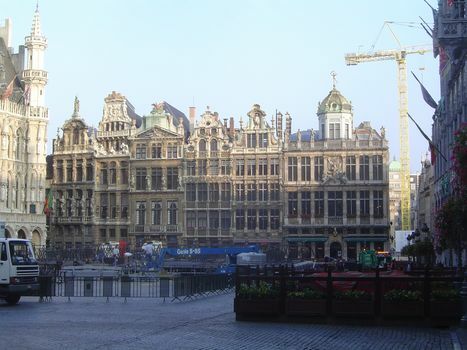 The French demolish entire town centres to be able to erect elegant, but uniform buildings.... What Hugo admired in Brussels was its impressive architectural variety, where every facade differs from the rest. ... This variety of styles reflected the mood of a country steeped in individualism." It's an anticipation of Lewis Mumford and Jane Jacobs and all the other denouncers of the heavy-handed urban-renewal programs that sucked the life out of American cities in the 1950s. What do the bourgeois do? Shop, of course. 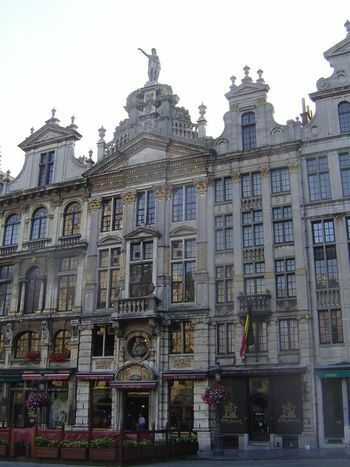 Here's a proto-mall near the Grand Place. 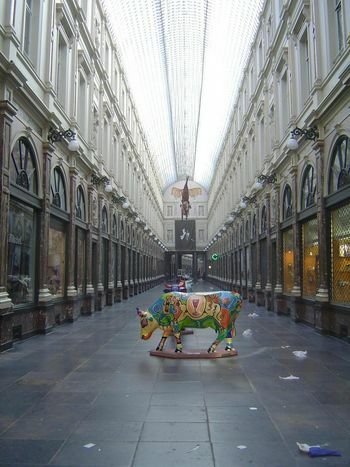 It's the Galeries Hubert, built in 1847 and 234 yards long. From the first, it was a major hit, despite its infinite repetition. 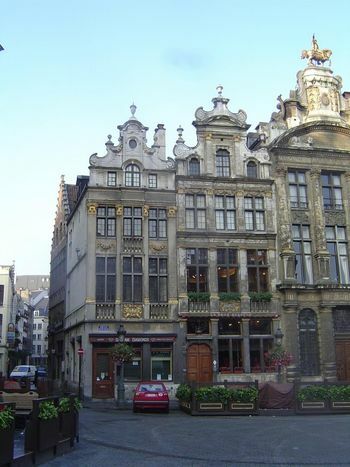 On the other side of the Grand Place, at Place St. Gery, there's a shopping center from the early 1870s. It, too, is glass roofed, but inside there's a floor-to-ceiling courtyard, rimmed with two walkways, one on top of the other--and all executed in naked wrought iron, flooded with light. And how shall the bourgoiesie make more money? 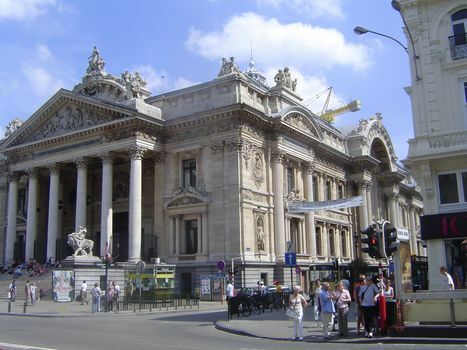 One answer: the Bourse, suggesting since 1871 the twin virtues of security and pleasure.